Description: Erect shrub 0.5–2 m high; stems hispid with reddish brown bristly, ± appressed hairs. Leaves elliptic, elliptic-oblong or ± ovate, 3–8 cm long and 10–30 mm wide, apex mostly rounded and apiculate, margins finely toothed, lamina ± glabrous but often bristly along veins; petiole 1–3 mm long. Inflorescences 3–11-flowered racemes, in upper axils or in a terminal cluster; flowers subtended by a small bract and with 2 basal bracteoles on the pedicel. Sepals ovate, enlarging and becoming white and firm-fleshy in fruit. Corolla 2.5–4 mm long, white. Nectaries 10 small free scales. Fruit, including the white calyx, 7–10 mm diam. when fresh. 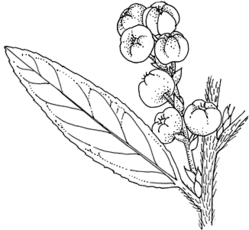 Distribution and occurrence: Grows in woodland, sclerophyll forest and rainforest margins, often in gullies and among rocks near cliff edges; widespread in high mountain areas, south from Ebor area, common at Barrington Tops. Fruit/seed Capsule enclosed in fleshy calyx 7--10 mm diam., fruit weight 310 mg, 330 seeds per fruit (extra data on seed & pulp characteristics in French 1991). Dispersal, establishment and growth Diaspore: seed, probably wind-dispersed. Interaction with other organisms Micorrhizal roots (Zomlefer 1994).